Watch this page for the details for the 15th Annual Diamond Ridge/Country Club Manor Garage Sales May 17th-18th, 2019. Once residents sign up, the details: addresses, dates/times, items being sold at each sale will be posted here. 4525 10th Street NW: HUGE moving sale! Lots of baby items (swings, seats, toys, jumpers, walkers, etc), book shelves, couches, coffee table, coats, shoes, clothes, house decor, lamps, picture frames, everything must go! 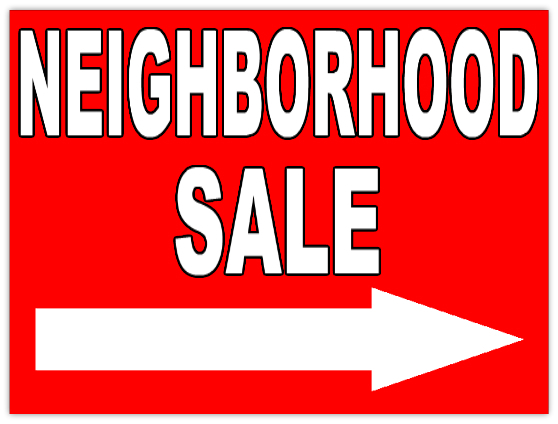 4932 10th St NW (Sat Only 8-2): boy's baby & toddler clothes, baby & toddler toys (lots), misc home decor, massage table & supplies, DVDs, books, 2 weed whackers, pool table, speakers, gardening supplies, bathroom scale, a few potty training chairs, & much more! 4032 7th Place NW (Fri 8-3 & Sat. 7-1pm) Children's clothes size 3T- 6x Toys (including play kitchen, easel, puppet show) Books Women's professional clothing sizes 8-12 Women and men's casual clothing Sports memorabilia Kitchen utensils & small appliances incl. microwave Plenty of other items. 4442 Manor Dr NW (Fri 8-3 & Sat 8-12): Move out sale. TV, TV tables, lazy boy, sofas, small kitchen appliances, utensils, kids clothes, toys, home decor, dining table, air mattress, and more. 4621 Manor Park Drive NW (Thur-3-6, Fri 8-5, Sat- 8-11): LIFE IS LIKE A GARAGE SALE! YOU NEVER KNOW WHAT YOU'RE GOING TO GET! We have a little bit of everything! Old stuff and treasures, home furnishings & decor, children's items & clothing, and more.